Healthy Byte: Gaining Fat or Muscle? Most of us have gotten the memo: strength training is a must for women who want to improve their health, feel fit and strong, and lose weight. But lifting weights can be an intimidating thing if you’re new to the game. When they first start strength training regularly, some women say they gain weight or feel themselves getting bigger, which can be a turn-off. If that sounds familiar, don’t go anywhere. We chatted with two experts who will explain exactly why that happens and what you can do to prevent it. Don’t let this discourage you! It’s all part of the process. As you build up all that muscle, you’re also revving up your metabolism, which will help you burn more fat in the long run. It’s that simple. If you feel like your body is getting bigger, rather than leaner, as you’re lifting weights, Magnus insists this has nothing to do with your workouts. It’s all about your diet. Easier said than done, we know, because the bottom line is, you get hungrier when you do more strength training. He recommends following the very simple formula of eating 30 percent protein, 40 percent carbs, and 30 percent healthy fats. This should keep everything balanced and help prevent any extreme weight gain. “Food is a big part of life, and it should be enjoyed,” Magnus told POPSUGAR. “I hate the ‘cheat day.’ Seventeen out of 20 meals should be on point, and you should enjoy life three out of 20. So it’s up to you when you want to do those three meals out of 20, but that’s my philosophy.” And it seemed to work for Alicia, because she looks lean AF in the trailer for Tomb Raider. To sum it all up, if you feel like you’re not getting leaner from strength training, don’t panic. You will inevitably see a little weight gain on the scale, but eventually you will start slimming down. And if you don’t, look closely at what you’re eating, because it’s so easy to overeat when you’re lifting weights. But sticking to your personal macros and following Magnus’s 17/20 rule will certainly get you to where you want to be. There are two types of exercisers in this world: those who must eat breakfastbefore a sweat sesh, and those that swear it’s better to exercise sans fuel. So who’s right? To help clear the air, Kristin Speaker, Ph.D, researcher and weight loss coach at Anschutz Health and Wellness Center in Aurora, Colorado, weighed in on the topic. Here’s what you need to know. But it all depends on what kind of workout you’re doing. “In general, the easier the exercise, the more actual fat you’re going to burn during the workout,” she says. For example, if you go for a 30-minute walk and cover two miles at a slow, steady pace, then Speaker says you’ll torch approximately 200 calories. If you’ve been fasting, your body will likely burn body fat, because the rate of energy production (a.k.a. how hard you were working) was really low and fat was easily accessible. On the flip side, if you go for a tough run, then your body starts to burn carbs instead of just fat. “When you go higher in intensity, your body can’t use fat fast enough, so it burns some fat and some carbohydrates,” says Speaker. That doesn’t mean slow and steady wins, though. Remember that your body only burns more fat during the actual workout when you slow your roll. Numerous studies have shown that high-intensity interval training stokes your metabolism and keeps burning fat long after your routine is done, so depending on how hard you worked, tough sessions may win out after you hit the showers. But What if You’ve Got No Energy? In other words, you’re good to do about an hour of cardio, max, while you’re fasted, says Speaker. If you’re generally in good health, there aren’t too many downsides to consider so long as you’re doing cardio (it’s a whole different ballgame for strength training), says Speaker. The main issue: Those on a low-carb diet, like Paleo diet followers, may struggle to bust out their best cardio workout because their livers don’t have a lot of fuel readily available, and it’s likely that they’re not fully recovering in between workouts because they’re not refueling their glycogen stores, she explains. But still, that’s not a serious health threat. “You’ll just hit a wall and your body will signal you to stop,” says Speaker. Your appetite post-workout may be affected, too. One study found that when runners hit the treadmill for an hour without eating first, they were more hungry than those who chowed down ahead of exercise. Try to make sense of what you see, and wonder about what makes the universe exist. With the rise of standing desks, office workers hope to brush off the health risks linked to prolonged sitting, including obesity, cardiovascular disease, diabetes, and early death. But they might do well to walk calories off instead, a new study suggests. In one of the few studies to carefully count the calories people burn while sitting at a desk, standing, or taking a leisurely stroll, researchers found little difference between being plopped down or upright. Standing for an hour might burn off an extra nine calories or so, about the amount in a single gummy bear. Slow walking, on the other hand, incinerated 2.4 to 2.7-fold more calories than standing or sitting, respectively. If office workers fit in an hour of strolling throughout each day—tallying trips to the bathroom, walks to the printer, or strides on a treadmill desk—they could easily burn through an extra 130 calories. That’s a little more than what previous research suggests could help people keep pounds off, the authors report in the Journal of Physical Activity and Health. “If you’re looking for weight control or just solely at the energy expenditure, standing isn’t that much more beneficial than sitting,” Seth Creasy, an exercise physiologist at the University of Pittsburgh and lead author of the study, told Ars. 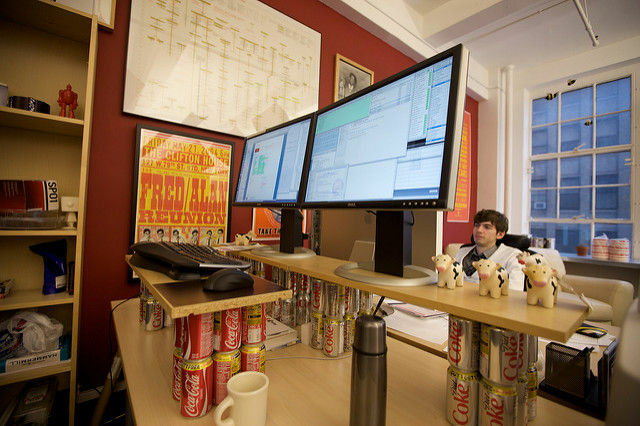 Of course, calorie burning isn’t the only reason people might choose a standing desk. Being upright could be beneficial for productivity or posture, Creasy said. However, more research is needed to know if those benefits are real because the studies that have been done so far have come up with mixed or inconclusive results. For energy use, though, the literature is getting pretty clear. In past studies looking into the differences between standing and sitting, researchers found small changes in calorie burningsimilar to those Creasy and his colleagues found. With their new study, they tried to nail those calories down for good and look at more than one single activity at a time. No one gets to the office and sits, stands, or walks for eight hours straight, Creasy explained. People switch positions, take breaks, and move around, he said. To see if there were any effects of those shifts, Creasy and colleagues set up an experiment with activity combinations. With a total of 74 healthy volunteers, the researchers randomly assigned 18 to sit at a desk with a computer for 15 minutes then stand without fidgeting for 15 minutes. Another 18 participants sat and watched television for 15 minutes and then walked. Twenty started with slow walking—at a self-selected speed of around two and half miles per hour—and then sat and watched TV. And the last 18 stood and then sat at a desk with a computer. During each 30-minute activity combination, the researchers had the participants fitted with face masks, which basically measured their exhaust. This allowed the researchers to precisely calculate how many calories they were burning. The researchers were curious if the order of activities changed how much energy participants used overall. For instance, perhaps starting with a walk would rev up calorie burning in subsequent sitting. But it turns out the order doesn’t matter. There was a tiny uptick, but nothing statistically or clinically significant, Creasy said. In the other combinations, the order didn’t matter either. In general, 15 minutes of walking burned an average of 55.9 calories, sitting with a computer burned 19.63 calories, sitting and watching TV burned 18.66 calories, and standing burned 21.92 calories. There was no statistical significance between the sitting activities and standing, the researchers noted. And even if it does result in a few extra calories burned, it’s unclear if that could result in any measurable health benefit. Like all studies, this one has some limitations. The study participants were healthy and mostly lean, unlike the general population and perhaps the people most interested in using a standing desk to help lose weight. But Creasy said he expects the general findings to hold up in people who are obese. The study also had people stand or sit as still as they could, so it might not capture any significant variations resulting from fidgeting or shifting around in either scenario. The study also doesn’t address a fundamental question in the sit vs. stand debate: are the negative health effects linked to prolonged sitting caused by the sitting itself or a lack of activity? Like prolonged sitting, a lack of exercise is also linked to obesity, cardiovascular disease, and diabetes. And earlier research has found that those who do sit for long periods but are also activedon’t face the same health risks. But other research has suggested that sitting alone can be bad, causing discomfort and poor circulation. Still, standing for long periods of time may also cause problems such as enlarged veins. On this bigger question, “the jury is still out,” Creasy said. Researchers are looking into whether exercise can override our sedentary lifestyles, plus whether standing desks benefit productivity, comfort, and other health issues. A few small studies have come out showing that standing desks can boost productivity, but a few others have shown that they don’t. Others are inconclusive. For instance, in a recent study on the productivity of call center workers who were assigned either standing or sitting desks, researchers found that the standers were as much as 53 percent more productive than sitters. But the study lacked baseline data of how productive each group was to start with, so the results are not conclusive. An interesting find, however, was that in surveys, the standing workers did report less back pain and discomfort than their seated counterparts. As researchers work out which desk setup might be best, Creasy points out that moving is always a good idea. He suggests getting creative with figuring out ways to add intermittent bouts of walking into your daily routine, such as moving the printer farther down the hall or having walking meetings. He points out that benefits can be seen with just casual, slow walking. This isn’t exercise, he emphasizes. Safety. It’s highly advisable to take reasonable safety measures while riding. After all, when we ride, we essentially traded the protective barrier a car offers for whatever we decide to wear or not to wear over our skin, flesh, & bones. Now I am not going to preach because my assumption is that everyone reading this is an adult who can make their own decisions. What I will do is share my own reasons why, like Vivian Ward, I too, am very much a “safety girl” but I did consider straying. However, as I continued my due diligence and came across this 2013 post by Richard Pytlak something he shared changed my perspective rather quickly. So like him, two events / experiences motivated me to not discount protective gear because I’m riding a scooter. The first was one of Pytlak’s experience. The first occurred while I was riding my bicycle in the neighborhood (yes, my bicycle). I always wear a helmet while on two wheels of any kind, and I feel pretty safe with a lid on. Even the lightweight helmets bicyclists wear are uncomfortable and block the cooling breeze from my head, but I still wear one because it’s important to me to protect my head. I also wear eye protection. I stick mostly to sunglasses, but I have clear lenses for after-dark wear as well. Getting bugs, pebbles or dirt in my eyes makes it tough to stay on course. During this incident, I was also wearing my usual tight-fitting cycle shirt and shorts, and my cycling shoes were securely clipped into my pedals. What happened was this: I pulled up to a stop light and slowed to a near stop. At the last second I decided to turn left onto a sidewalk. As soon as I turned the handlebars, I fell. Did not pass go. Did not collect $200. I fell instantaeously. I haven’t fallen from two wheels since I was a tyke, and man did that hurt! No broken bones, but I scraped up my arm, elbow and my knee and jarred my head and bruised my hip. I was bleeding. Not only did it hurt — a lot — but I was banged up for more than two weeks. How fast was I going? Exactly 0 mph. All I did was fall onto the concrete, and it banged me up good. Most people think injury danger is directly related to speed, but I learned the hard way (literally) that it’s very easy to hurt myself coming off a bike at any speed — even no speed. I don’t know why it never dawned on me how much falling hurts! And the reality of how much the potential damage can be exponentially increased in severity when we add in speed! EUREKA! The Hubs has been riding a motorized 2-wheel since he was 12. He is a careful rider and is religious about wearing a helmet, protective jacket, and gloves. No matter if it is 97 degrees outside with 100% humidity making it feel like 103. If he is on his 650 cc, he is in his protective gear. He was meeting me at a picturesque spot for me to take his photo on his bike when I got a phone call from him saying that he was fine but that he just laid his bike down. My heart was pounding and I must have asked him 10 times if he was okay. When I met him back home I saw the state of his bike and then his jacket. He walked away with some minor scrapes on his hips and was a little sore for a few days. His CE elbow & shoulder jacket did it’s job and protected him on all the high impact areas. Otherwise, all the places where the ripped mesh is, would have been his skin, flesh, and possibly bone. How fast was he going? About 15 mph. YES – THAT happened from just 15 mph! So when I see celebrities wearing a bikini riding around on a 50 cc (top speed of about 35 mph) looking great for photo ops, the reality is, if they went down, the road beneath them would shred their skin like cheese on a cheese grater! With these two experiences logged in the back of my mind I had decided that at a minimum I would wear a leather jacket of at least 1.1 mm thick for the abrasion resistance during the chiller months or my mesh jacket with CE level 1 shoulders, elbows, and spine protector during the warmer months, gloves with premium grade goatskin palm for maximum abrasion resistance, and a minimum of a DOT rated helmet. Yes, this may feel awesome with the breeze stroking her hair on a hot summer day and they may even look “cool” but in a matter of milliseconds THAT can turn into THIS (WARNING: Disturbing Images – MAY NOT BE SUITABLE FOR SENSITIVE VIEWERS). So yes, I will look like the super dork armored-up in my protective gear on my scooter puttering about, because this scooterist is rather fond of her skin to be right where it is … ON! We’ve been conditioned to think of exercise as a key ingredient — perhaps the most important ingredient — of any weight loss effort. You know the drill: Join the gym on January 1 if you want to reach your New Year’s weight loss goal. But in truth, the evidence has been accumulating for years that exercise, while great for health, isn’t actually all that important for weight loss. To learn more about why, I read through more than 60 studies (including high-quality, systematic reviews of all the best-available research) on exercise and weight loss for a recent installment of Show Me the Evidence. Here’s a quick summary of what I learned. One very underappreciated fact about exercise is that even when you work out, the extra calories you burn only account for a small part of your total energy expenditure. 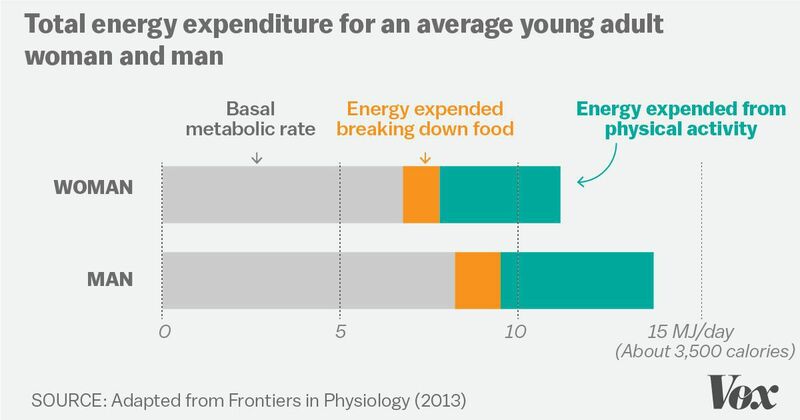 There are three main components to energy expenditure, obesity researcher Alexxai Kravitz explained: 1) basal metabolic rate, or the energy used for basic functioning when the body is at rest; 2) the energy used to break down food; and 3) the energy used in physical activity. What’s important to absorb is the fact that we have very little control over our basal metabolic rate, but it’s actually our biggest energy hog. “It’s generally accepted that for most people, the basal metabolic rate accounts for 60 to 80 percent of total energy expenditure,” said Kravitz. Digesting food accounts for about 10 percent. The implication here is that while your food intake accounts for 100 percent of the energy that goes into your body, exercise only burns off less than 10 to 30 percent of it. That’s a pretty big discrepancy, and definitely means that erasing all your dietary transgressions at the gym is a lot harder than the peddlers of gym memberships make it seem. 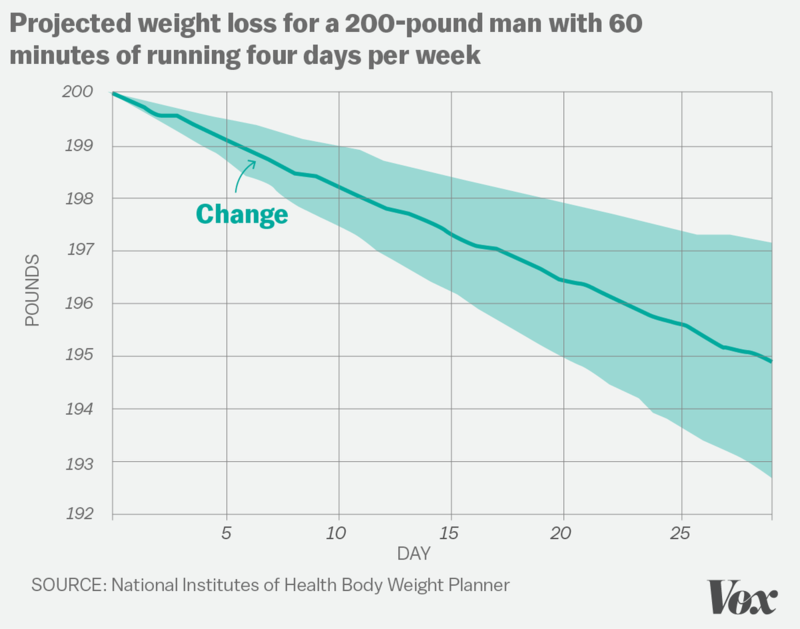 Using the National Institutes of Health’s Body Weight Planner — which gives a more realistic estimation for weight loss than the old 3,500 calorie rule — mathematician and obesity researcher Kevin Hall created this model to show why adding a regular exercise program is unlikely to lead to significant weight loss. So if one is overweight or obese, and presumably trying to lose dozens of pounds, it would take an incredible amount of time, will, and effort to make a real impact through exercise alone. How much we eat is connected to how much we move. When we move more, we sometimes eat more too, or eat less when we’re not exercising. One 2009 study shows that people seemed to increase their food intake after exercise — either because they thought they burned off a lot of calories or because they were hungrier. Another review of studies from 2012 found that people generally overestimated how much energy exercise burned and ate more when they worked out. “You work hard on that machine for an hour, and that work can be erased with five minutes of eating afterward,” Hall says. A single slice of pizza, for example, could undo the benefit of an hour’s workout. So could a cafe mocha or an ice cream cone. There’s also evidence to suggest that some people simply slow down after a workout, using less energy on their non-gym activities. They might decide to lie down for a rest, fidget less because they’re tired, or take the elevator instead of the stairs. These changes are usually called “compensatory behaviors” — and they simply refer to adjustments we may unconsciously make after working out to offset the calories burned. By preventing cancers, improving blood pressure, cholesterol and sugar, bolstering sleep, attention, energy and mood, and doing so much more, exercise has indisputably proven itself to be the world’s best drug – better than any pharmaceutical product any physician could ever prescribe. Sadly though, exercise is not a weight loss drug, and so long as we continue to push exercise primarily (and sadly sometimes exclusively) in the name of preventing or treating adult or childhood obesity, we’ll also continue to short-change the public about the genuinely incredible health benefits of exercise, and simultaneously misinform them about the realities of long term weight management. The evidence is now clear: Exercise is excellent for health; it’s just not that important for weight loss. So don’t expect to lose a lot of weight by ramping up physical activity alone. As a society, we also need to stop treating a lack of exercise and diet as equally responsible for the obesity problem in this country. Public-health obesity policies should prioritize fighting the over-consumption of low-quality food and improving the food environment.